It all began in 1992 when Lalit Kumar Lama (Ex proprietor) and I (Sanjay) went up for a walk in Thamel, the hottest tourist place in Katmandu, Nepal. We were called upon to deliver over 50 pcs of Kukris (Khukris) to this bar which was selling Kukris to tourists and needed real ones made by us. It was the first time we took a walk to this place and were surprised and shock to see fake Kukris lying all over the place which had hardly anything in it to be called a Kukri. The qualities of these Kukris were so poor that we felt so bad and pitied all the tourists who had bought them. We wondered how their reactions were after they used them and the moment they did, the blade was worth nothing than a butter blade or worse. I’m sure they felt cheated and ripped off. The prices too for these crap Kukris were unbelievable. The Kukris by the vendors were placed all along the floor as if the Kukris had no values at all. The Kukris at one time that shock the world as the fierce weapon of all, used and carried by the brave Gurkhas was nothing but a cheap tourists item laid all along the floor. Well we do know for sure that some of the vendors did make something of it for years ripping off tourists who wanted a real Gurkha Kukri thinking what a cool memento it would be and a useful one if needed to chop something with. They should have at least given these Kukris some respect and at least a proper care and a place but No, they were all tarnished, rusted and all over the floor. It was then we thought that it was time we do something and earn back the respect these Kukris deserve. Our intension was to give these Kukris the fame and the name it once owned. Second, provide our valuable tourists the real Kukris they deserve after paying for it and third, only letting them pay s/he needs to pay for a real handmade Kukri. Not a dollar more. The mission got started and the search was on for a rented shop in the heart of the city called Thamel. Finding a rented shop was the most difficult part. No room came out without a huge price tag. Thamel, a place where all shops were occupied by Kashmiris from India who were paying good money for any new rented shop, we were forced to rent a small shop not bigger than a rest-room found in ones houses. The risk was on and we had to make most of what we had and could afford with. The first Khukuri (Kukri) store got set up and named Khukuri House. I, Sanjay lama who just had finished school got appointed as the sales man. 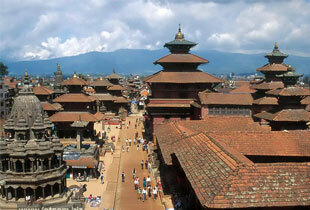 The location of our store was bad as we placed at the end of thamel. A month went by and there was not a single sale. It was then after two months people started noticing and curious tourists began entering and made enquiries about my Kukris. The results were as expected as good things are always rewarded and sales started happening. One day there would be sale of five and the other there would be ten. Still the majority of tourists had no idea where I was having been placed at the end of Thamel. I knew, I have to move in deeper, further at the center. The search was on again for a better location at the center as possible so that all the tourists can see me and no tourist would be ripped off by these street vendors or peddlers ever again. It was after eight months after the opening of our first small store, we moved in a bigger space and now in a better location but still not the best as the price was awfully too much at the center. This is Khukuri House in thamel now. The first genuine gurkha knife store in the nation. The only store that sells real handmade Kukris, made by the same makers that make them for the British Gurkha Regiment, the quality people can trust and can buy without much worrying about the price. 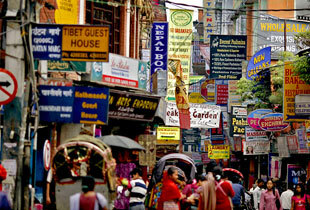 Khukuri House Thamel became the No 1 shop in Nepal and is recommended in all travel books that leads to Nepal. When one needed to buy the hottest souvenir from Nepal, nothing popped out first than a Kukri and they all knew where to find one and who to trust. Kukri/Khukuri/Khukri no matter how you call it, it always refers to a thick curved sharp metal used and carried by Gurkha soldiers during parade and in combat. The fame and name it once owned and the respect and care it needs was restored by Khukuri House Thamel. 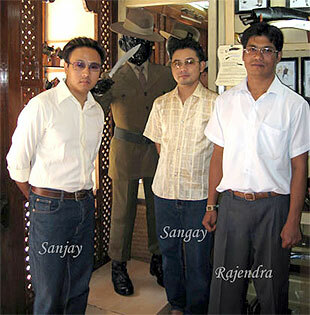 That’s me, my brother Sangay and my staff Rajendra. 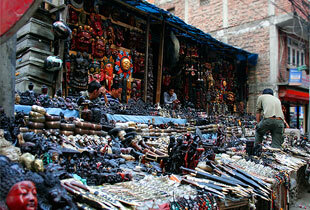 Of late, many Kukri shop have come up in the Katmandu city which deals in imitation of our Kukris (Khukris). They not only imitate our products but almost everything from our name, style, literature to decoration and our Khukri photos. At one time these shops were selling garments, pashminas and jewelries etc. They got rid of all their stuffs, replaced and restocked with cheap Kukris locally made and cheating tourists saying it’s from Khukuri House. Some even say that they are our branch. We strictly caution our customers to be aware of such scamps and pledge to uphold the reputation of genuine Khukri manufacturer on Nepal. We inform our customer coming to Nepal that we have only one shop in the name of “Khukuri House” (no other words in front or at back) at Thamel in Katmandu, Nepal.